Winter is here but theres no slowing down for Colour City Dragons! Please read and note dates and times It may be helpful if events are listed in chronological order so……. Saturday 04th June – Training is at 1pm, because Pan Dragons want to have taste of race conditions – ie they want to race against CCDragons. This is a new club – lets encourage them much as we can – that doesn’t mean we let them beat us!! Weather permitting – if it doesn’t (permit) then you may like to come along anyway and help get the Kiosk ready – see below . Sunday 05th – Car Boot Sale – you’ve got all the information, if you’re not selling we need some helpers selling raffle tickets (The $2000 Father’s Day raffles – we have 3000 tickets to sell). Taylor is coordinating the Book/dvd/cd/video and jigsaw table – heap of great jig saws have been donated. Don’t miss out on them. All funds raised from the book stall goes to the Club to support juniors attending regattas. Kaye takes the prize for proactive promotional work, Kaye has letter dropped SIXTY THREE flyers. Great effort Kaye. Tuesday 7th – 5.45pm Training at the Kiosk ‘Gym’ or shall we call it the Kiosk Club House.? We have the erg machine, I think a rowing machine will appear, we may have loan of a walking machine. If you have skipping ropes, gym balls, weights, any portable gym equipment you could bring along to share, I’m sure that will be appreciated by all. Can you let me know if you have any equipment available so training plans can be put together. Thursday 9th – 6pm meeting at Hotel Canobolas (not Wednesday) Mel will be present. Saturday 11th – to Lake Cargelligo, all very casual, perhaps we can meet up for lunch somewhere, paddling with the Lake Dragonflies in afternoon then those who choose to stay overnight – can meet up for dinner in the evening. Sunday 26th – Steve Davidson – Australian and NSW State squad Coach will be with us. Our ‘older’ members will remember Steve’s coaching clinic during our first season. Weather permitting, we will do some work on the water BUT if not possible the training will take place in the Kiosk Club House/Gym, including trials on the erg. If you can make it to this – let me know. If we don’t have the numbers we’ll open it up to other Clubs. July 11th Friday– Harry Potter movie night. If your family thinking about seeing this movie – make it with CCDB Club. We need to sell 200 plus tickets to raise maximun funds. There’ll be eats and drinks before the movie, plus lucky door prize. We will have the tickets available later this week. Elise Jones is off to Armidale this weekend with the Orange rep team competing in the State Hockey Finals – good luck Elise. Alex, along with the rest of the Orange High School Band returned from the National Band Championships covered in glory. Great performance Alex. Sound of Music – was enjoyed so much by all and DA Orange raised little over $800, great result all round. Our boat has been ordered, expected arrival August! Can you help? – Accomodation . The Coaching Course taking place July 30/31st. This is first time we have been able to have a coach training course this side of the Blue Mtns but it still means travelling quite a distance for the Lake Cargelligo and Wagga people. If anyone is able to offer accomodation I’m sure it would be very much appreciated. If you can help can you let me know asap. Kamini Jain– the Canadian coach WILL be heading our way. The initial response to my call for expression of interest from you and other Western Region clubs was very positive, (27 people). 50 will be the maximun number. Kamini only contacted me few days ago to confirm so I have some work to do before I can finalise costs but I’m anticipating it will be around $350 to $375 per person, that includes accomodation for 2 nights and 2 full days coaching from a world class coach. Yvonne has found information on the web. Rashie shirts that act as life jacket, various types can be purchased including self inflating ones, be worth checking out. Training at 8am on Saturday mornings hasn’t been well attended the last 2 weeks, even when the weather was beautiful. Those that did turn up enjoyed a brisk walk around the Lake, all good for maintaining the fitness. However, in keeping with Committee’ decision (of couple months ago) Long Weekend is officially last weekend of the season for ‘on water’ training (which will be at Lake Cargelligo). 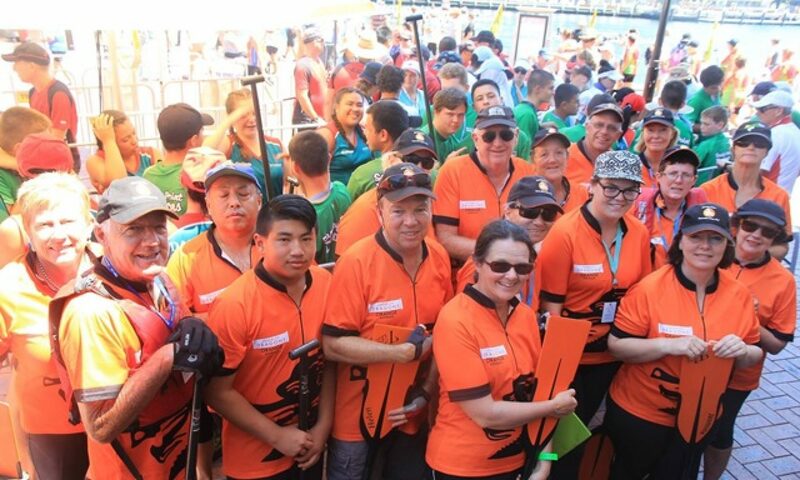 Winter is here but theres no slowing down for Colour City Dragon Boat Club Exception being June 26th and Steve Davidson’s visit. Starting next Tuesday 07th – 5.45pm we will have training in the Kiosk. PLUS negotiations are again in progress for training at the PCYC to take place Saturday mornings. This was very popular last winter. For those not aware – membership of PCYC is required, last year it was $15 adults, $5 for juniors. Club members can attend the PCYC gym when they like (fee of $5 each session) but Saturday mornings with a personal trainer, ie boxer Bobby Williams running a session for Club members only. Again $5 fee required and must guarentee minimum of 10 members participating . Will let you know when arrangements are confirmed..